Argyranthemum frutescens is commonly known as the ‘Federation Daisy’ or ‘Marguerite daisy’ and is originally from the Canary Islands. 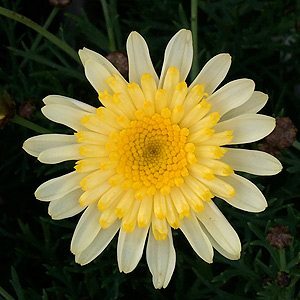 A number of hybrids are available many bred in Australia.’ The species is a perennial with pale yellow or white daisy like flowers. Long flowering and very hardy they are well suited to growing both in containers and in the garden. With masses of flowers from autumn through to spring they make an great plant for a sunny patio, also useful for cut flowers. Plants will generally reach a height of around 60cm – 1m with a spread of 70cm, depending on soil, position and cultivar. Plants can be tip pruned from an early age to promote a bushy habit. Gardeners should be advised not to cut back not old wood as it will probably not re shoot . Full sun well, humus rich well drained soil, and suited to growing in containers. With new cultivars being released regularly by wholesalers we list some of the more popular varieties at time of writing. 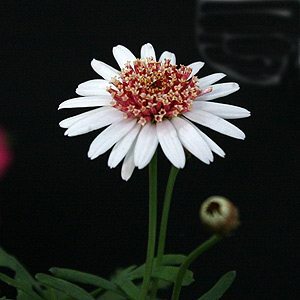 Argyranthemum frutescens ‘Summer Eyes’ has attractive crimson red centres with white petals. Argyranthemum frutescens ‘Sunny Days’ has pale yellow petals with a deeper yellow anemone centre. HAAR’S NURSERY – Ph 03 5977 4631 Fax: 03 5977 3385 1375 Frankston Flinders Road, Tyabb, VIC, 3913. Wholesale only. Incl: Federation Daisy Bright Carmine, Fed Daisy Sunjay, Fed Daisy Pink Summit, Fed Daisy Sugar Cheer, Fed Daisy White – Oasis. Flowering colour, indoor and outdoor lines and herbs. Supplier to retailers and landscapers.